Eaton Vance Corp. (EV), through its subsidiaries, engages in the creation, marketing, and management of investment funds in the United States. It also provides investment management and counseling services to institutions and individuals. Eaton Vance is a dividend champion which has paid uninterrupted dividends on its common stock since 1976 and increased payments to common shareholders every year for 34 years. The most recent dividend increase was in October 2014, when the Board of Directors approved a 13.60% increase in the quarterly dividend to 25 cents/share. Eaton Vance’s largest competitors include Franklin Resources (NYSE:BEN), T. Rowe Price Group (NASDAQ:TROW) and Blackrock (NYSE:BLK). In a previous article I mentioned that I am bullish on asset managers for the long run. Over the past decade this dividend growth stock has delivered an annualized total return of 7.20% to its shareholders. 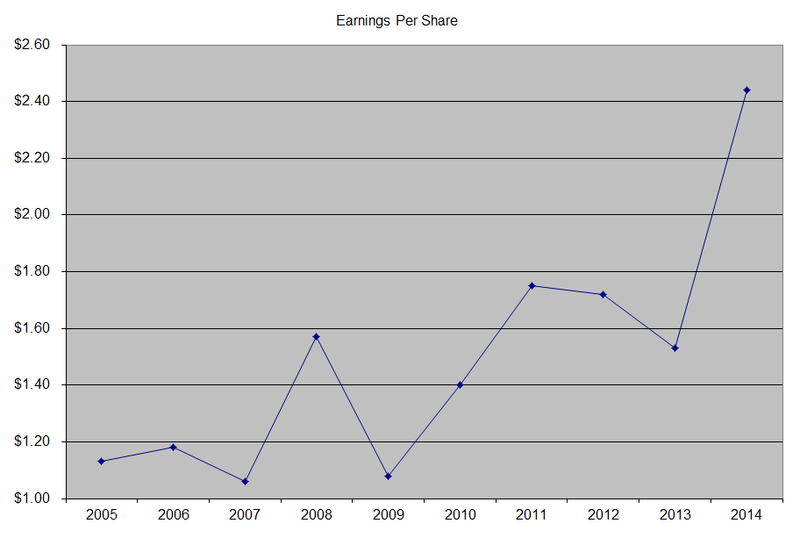 The company has managed to deliver a 9.30% annual increase in EPS since 2004. Analysts expect Eaton Vance to earn $2.49 per share in 2015 and $2.83 per share in 2016. In comparison Eaton Vance earned $2.44 /share in 2014. 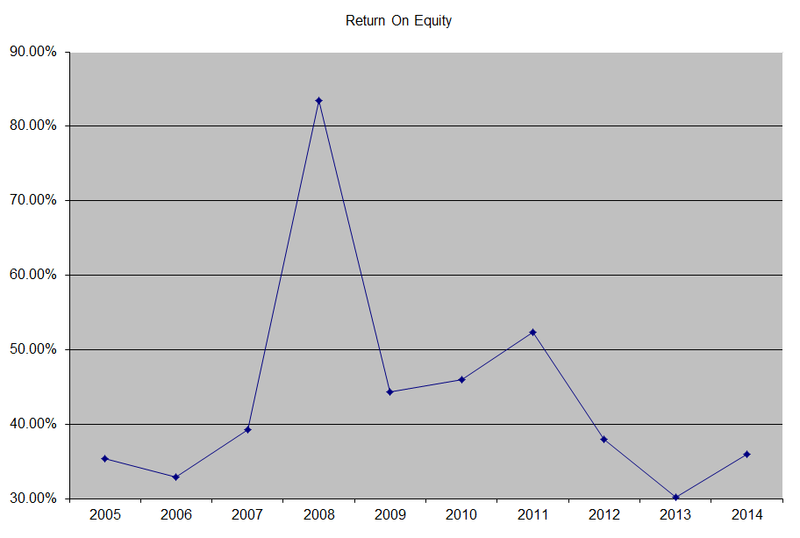 The company has managed to consistently repurchase common stock outstanding over the past decade. As a result of these share buybacks, shares outstanding decreased from 142 million in 2005 to less than 119 million by 2014. Overall I am bullish on asset managers in the long run, and Eaton Vance fits by default. The more assets under management they gather, the better the scale against competitors. Since investments grow in value over time, this makes it easier to simply generate higher fees without much additional insight. Switching costs to investors are high, since they would have to incur steep taxes and penalties as well as the uncertainty of finding an untested solution for their money. Therefore, a large portion of investors stick to the products they own. Eaton Vance is a player that targets tax-sensitive investors in fixed income and securities. They are also a leader in closed-end funds. These assets are more sticky, and account for roughly half of assets under management. A company like Eaton Vance is worth a second look, since it has managed to attract and retain assets under management throughout different market cycles. As we have millions of baby boomers retiring and needing financial advice, I expect them to use financial advice from certified planners, which would pre-sell open and closed-end funds and other financial products. Once a product has been sold to investors, it creates a recurring income stream to the provider of funds. The revenues that investment managers generate are realizable in cash almost instantaneously, which is a big plus. New product offerings could also contribute to growth, although at $298 billion in asset under management, it won’t be the main source of revenues for Eaton Vance. Eaton Vance has recently been cleared by the SEC to sell actively managed Exchange Traded Funds where holdings do not have to be disclosed daily. Acquisitions to obtain advisers that target high-net worth individuals could be a big driver for future growth, as would be expansion internationally. Another positive is that as US stock prices keep increasing, this would eventually attract more investors to add in more money, which would create even higher profits for companies like Eaton Vance. Over time I expect Eaton Vance to get an even larger pile of assets under management due to all of the above mentioned reasons, which would lead to earnings and dividend growth. One of the largest risks for Eaton Vance includes competition, which could result in net outflows for assets under management as well as decrease in fees charged to clients. Another risk includes prolonged declines in equity and fixed income markets, which could turn investors off stock market investing. A third risk includes underperformance relative to benchmarks, which could lead to outflows. The company generates a very high return on equity, which has followed the ups and downs of the stock market over the past decade. Rather than focus on absolute values for this indicator, I generally want to see at least a stable return on equity over time. The annual dividend payment has increased by 12.70% per year over the past decade, which is higher than the growth in EPS. A 13% growth in distributions translates into the dividend payment doubling almost every five and a half years. If we look at historical data, going as far back as 1990, we see that Eaton Vance has actually managed to double its dividend almost every four years on average. The dividend payout ratio has increased from 26.70% in 2005 to 58% in 2009, before falling down to 37% in 2014. The reason behind this increase was the fact that dividend growth exceeded earnings growth over the past decade. A lower payout is always a plus, since it leaves room for consistent dividend growth minimizing the impact of short-term fluctuations in earnings. Currently Eaton Vance is attractively valued at 17 times forward earnings, yields 2.30% and has a sustainable dividend payout. If the stock yields more than 2.50%, it would be attractively valued per my entry criteria. A 2.50% yield would be equivalent to a stock price dip below $40. - How to reach your dividend income goals?